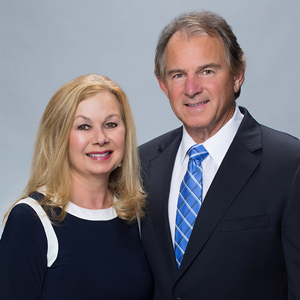 Kelly and John Starkey have been in the real estate industry their entire careers. During her 30 years in the mortgage business, Kelly has worked in all aspects of lending. John, a licensed general contractor, has worked primarily in new home sales. Kelly and John Starkey have been in the real estate industry their entire careers. During her 30 years in the mortgage business, Kelly has worked in all aspects of lending. She’s an expert in structuring a loan to fit her clients’ needs. The Starkeys work with a dedicated team who are each experts in a piece of the homeownership puzzle. “That’s very important to achieving a smooth closing,” says Kelly. John, a licensed general contractor, has worked primarily in new home sales. He’s very familiar with home construction, sales, and inspections — knowledge he puts to work for REALTORS® and home buyers. “Our goal is to help everyone who desires to own a home figure out the best way to get there,” he says. Sherwood M. and Geraldine M.
I had a great experience! I am a first time homebuyer, and Team Starkey was with me every step. I closed two mortgages in two months. My experience was far superior with Atlantic Bay Mortgage Group compared to my experience with another company. Attention to detail, responsiveness, accuracy, and efficiency with closing was much more professional. Charles B. and Syna B.
Kelly Starkey was excellent throughout the loan process. I would highly recommend Atlantic Bay Mortgage Group to anyone! Jeffrey C. and Pamela C.
Kelley, Susan, and Brad were great to work with! Darrell B. and Laura B. This experience was the best ever. As a first time homebuyer not knowing the process, it was all made simple and easy and I could not ask for any better. Kelly and John were great! They were friendly and professional. Kelly and John Starkey were phenomenal during our buying process. They were there to answer all our questions along with Susan. There was no stress for my wife and I, and we were thoroughly pleased with Atlantic Bay Mortgage Group. Kelly and her team were amazing and were very professional to work with. Evelyn C. and Roger C.
Everyone was incredibly helpful, patient, and kind, especially with us being first-time homebuyers. We would recommend Atlantic Bay Mortgage Group to anyone who appreciates great service! James L. and Michelle L.
We had a wonderful experience and it was awesome! Everything went smoothly and the whole staff at Atlantic Bay Mortgage Group made my wife and I feel comfortable. Travis G. and Courtney G.
The customer service was excellent and Kelly Starkey was very professional and attentive. We were more than pleased! Roger H. and Phyllis H.
John Starkey was great and walked us through the loan process, making everything so easy for us. I love working with him! Adam M. and Victoria V.
Kelly and her team were all friendly and great to work with, making the home buying process comfortable. Kelly and her team were very professional, Friendly, and knowledgeable.